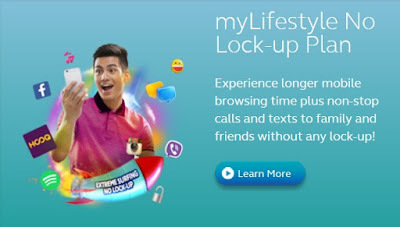 If you're interested in getting a postpaid plan without all the boundaries and restrictions that come with them, Globe Telecom is offering a new myLifestyle No Lock-Up plan. The new plan will let subscribers surf and stream with almost twice the data allowance, giving them more mileage in the long run. It even comes with unlimited texts to all networks, so you're still connected with everyone in your circle regardless of their subscriptions.You're not locked up to any contract periods, and you get a bigger data allowance as well as free content in the process. Now the affordable devices have making their way into the market, Globe's myLifestyle No Lock-up plan will let its subscribers use the device of their choice. All they would then need is just one valid ID to continue on with the process. Starting at Plan 599, Globe's new postpaid offerings come with unlimited calls and texts to Globe and TM networks, unlimited texts to other networks, and free Facebook for the whole 2 years. What's more, there's also 3 months of free Spotify or HOOQ subscription, depending on the offer that they opt with. In perspective, Plan 1499 on the regular postpaid plan only comes with a 5GB data allowance. On the No Lock-up plan, you'll get 10GB instead. The No Lock-up offering is available in nano, micro, and standard SIM variants to make sure that it can work with whatever device you have.